As promised, here is the tute for the boy pilgrim for the clay pot pilgrim couple. I posted the tutorial for the girl pilgrim yesterday. 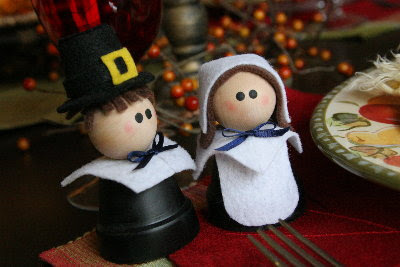 He's a bit more complicated than the girl because of his hat, but they make such a sweet couple. 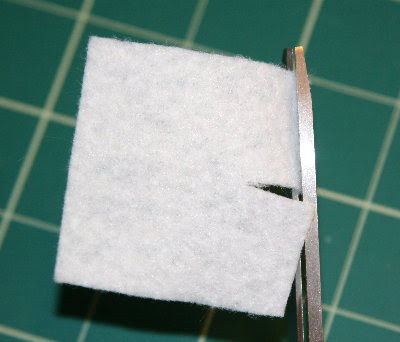 Begin by cutting a 3/4" slit into the center of the edge of one side of the 2" x 2" piece of white felt. 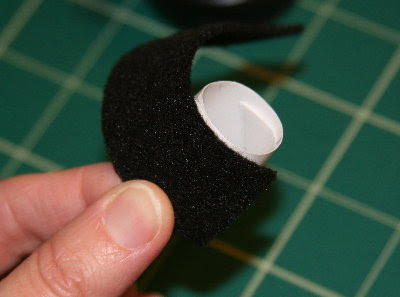 Optionally, trim a slight curve or angle into the two halves to add a little shape to his collar. Glue the collar to the center of the bottom of the clay pot. 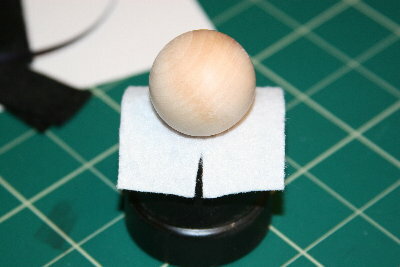 Glue the wooden ball onto the center of the collar. Now, shape the hair. 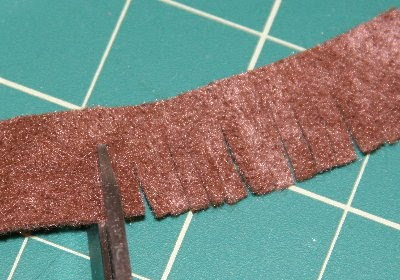 Fringe one side of the piece of brown felt, making tiny snips the length of the felt. 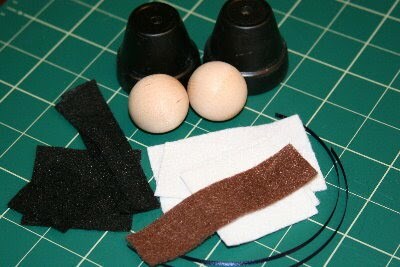 Twist the uncut edge into a circle and glue in place on top of the head. 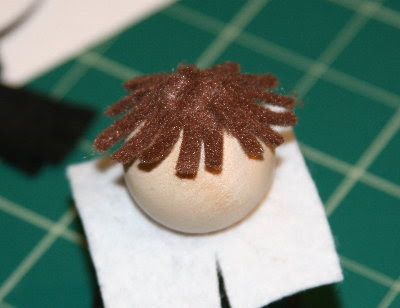 The hair is really a great place for individual creativity, just like in real life. This was by far the funniest step when I did this with my family. 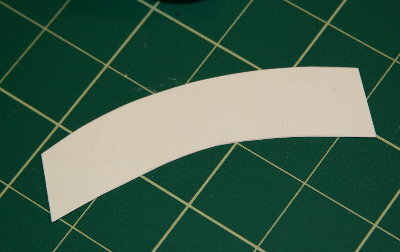 Next, trim the piece of cardstock into an arc. 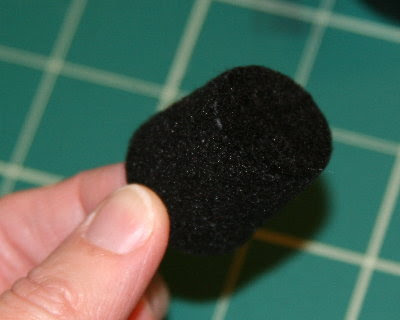 This doesn't have to be exact and the shape can vary. 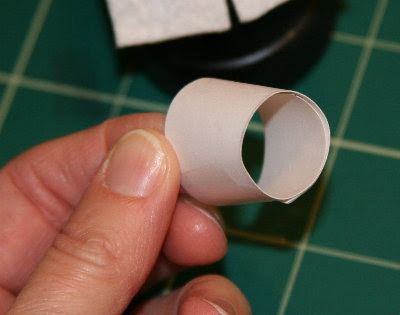 Turn the piece of cardstock to form a loop and glue or tape securely. 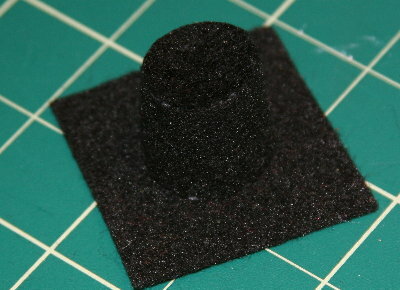 Cover the loop of cardstock with a piece of black felt. Trim as necessary. 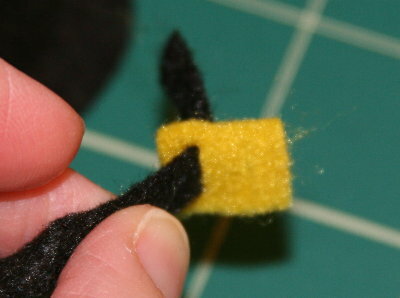 Apply glue to the tip of the narrow end of the loop. 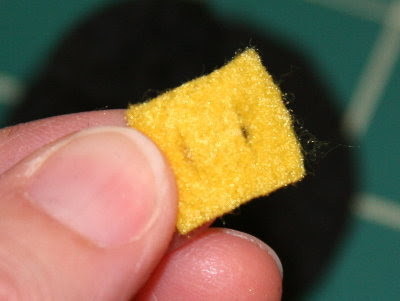 Place a small piece of felt covering the end. 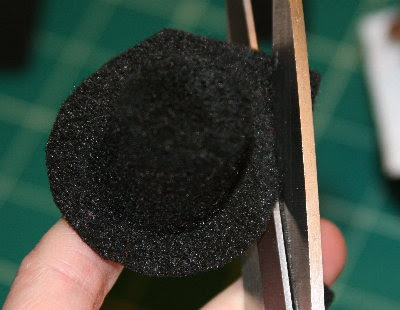 After the glue has set at least somewhat, use a sharp pair of scissors to trim the excess felt from the top of the hat. When you're finished, it should look something like this. 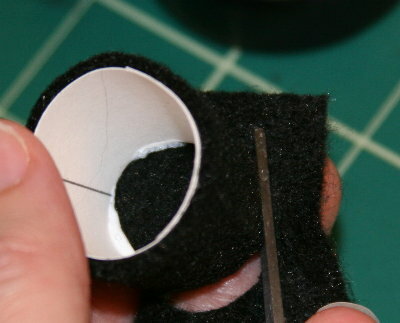 Now, apply some glue the to other edge of the loop, and glue a large piece of felt centered in place. 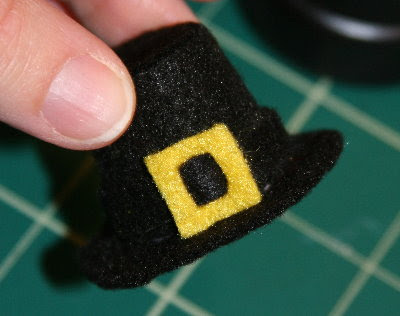 Use scissors to trim the excess felt, leaving about 3/8" of felt for the brim of the hat. 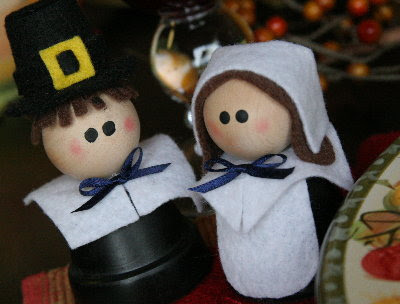 Set the hat aside. 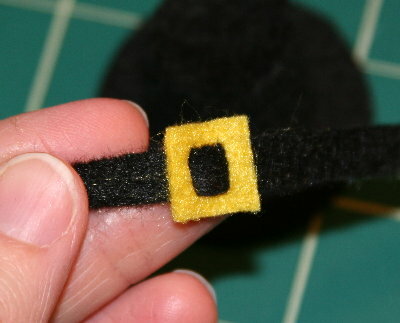 Trim the piece of gold felt into a belt buckle by cutting two parallel slits into the center. 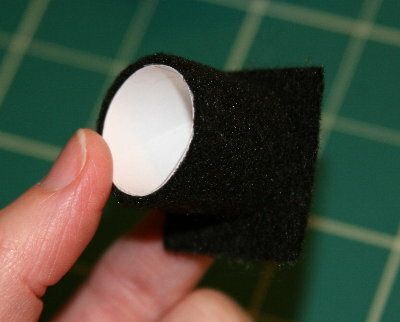 Feed the narrow piece of black felt through one of the slits, being careful not to rip the felt for the buckle. Feed the end through the other slit. Slide the buckle to the center of the "belt." Glue the belt onto the hat just above the rim. 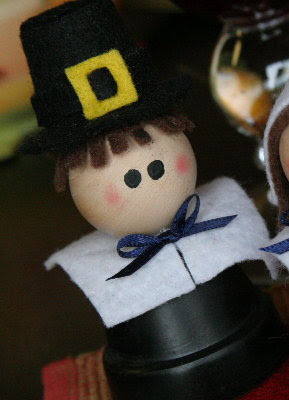 Glue the hat onto the boy's head. 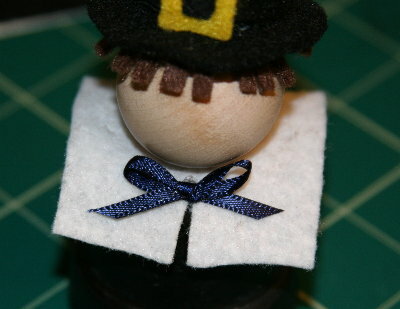 Tie the piece of ribbon into a small bow and glue it to the collar just above the slit. 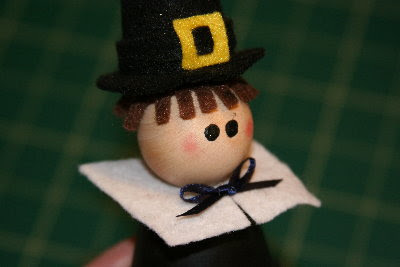 Use paint or black markers to add eyes and apply blush to the cheeks, and that's it! 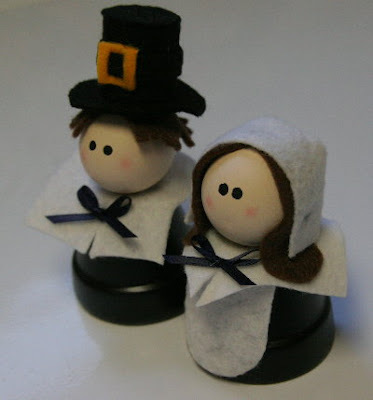 If you try this craft, I'd love to see yours! And I'd also love to hear what you do with them.